When was the last time you saw the back of your comics? 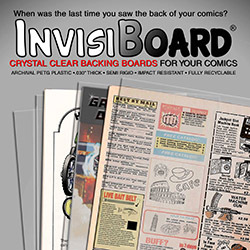 Our new INVISIBOARD® Comic Backings allow you to do just that! family of plastics which is archival and acid-free. It is .030" thick, semi-rigid, impact resistant, and fully recyclable! MicroChamber Paper is a very thin, nearly transparent, interleaving paper that contains dispersed molecular traps that remove and neutralize acids, pollutants, and the harmful by-products of deterioration. Insert one or two sheets in your comics and know that you are effectively practicing preventative conservation for your collection. It also eliminates odors such as smoke, mold, and mildew. NOTE: Temporarily our MicriChamber Paper is without the watermark you are accustomed to seeing. We want to assure you that this material is the exact same material. The manufacturer of the paper is recreating the tooling for it and you should resume seeing the watermark after April 2019. Our COMIC BOARDS are specifically designed to fit into OUR poly bags. Placing a backing board behind or preferably in the center of your comic, then putting it inside a poly bag helps prevent the comic spine from crushing and the comic pages from crimping or wrinkling. 1. Short-Term Storage- BASIC BOARD - pH neutral (contains acid) .24 point thick. Double white. WHOLESALE. 2. Short-Term Storage- CHIPBOARD - pH neutral (contains acid) .30 point thick. White on one side. ECONOMICAL! 3. Long-Term Storage- STANDARD ACID-FREE is acid-free* all the way through. Acid-free board can trap migrating acids in paper and neutralize it. Use our .028 point board for intermediate to long-term storage. White on both sides. 4. Indefinite Storage - SUPER ACID-FREE - Our .40 point thick board is off-white, 100% alpha cellulose board and is *buffered with calcium carbonate, which keeps the board from breaking down (indefinitely). Acid-free (alkaline 8.0-9.0), lignin-free, contaminant-free. Suitable for conservation. Meets the Library of Congress Archival Standards for indefinite storage. 5. Indefinite Storage - Archival PETG Mylar® (Polyester) .030" thick, semi-rigid, impact resistant, fully recyclable, archival, and acid-free. Meets Library of Congress Archival Standards for indefinite storage. *Acid-free board can trap migrating acids in paper and neutralize it. A buffered board can stop migrating acids from entering an object and therefore prevent damage. 5-9/16 x 8-7/16" .030" thick. White one side. Short-term Storage. 5-9/16 x 8-7/16" .028" thick. Acid-free. 5-9/16 x 8-7/16" .040" thick. 6-11/16 x 10-3/8" .030" thick. "BASIC BACKINGS" for New Comics. 6-11/16 x 10-3/8" .024" thick. 6-11/16 x 10-3/8" .028" thick. 6-11/16 x 10-3/8" .040" thick. "BASIC BOARDS" for Regular Comics. 6-15/16 x 10-3/8" .024" thick. 6-15/16 X 10-3/8" .030" thick. 6-15/16 X 10-3/8" .028" thick. 7-3/16 x 10-3/8" .030" thick. 7-3/16 x 10-3/8" .028" thick. Acid-free. 7-3/16 x 10-3/8" .040" thick. 7-11/16 x 10-3/8" .030" thick. 7-11/16 x 10-3/8" .028" thick. 7-11/16 x 10-3/8" .040" thick. 10-1/4 x 14-1/4" .030" thick. 10-1/4 x 14-1/4" .040" thick.